Most British Columbians don’t know there’s a hobby farm jumping with kangaroos in the heart of the province’s Okanagan wine country. Kangaroo Creek Farm, one of the more unusual attractions in Kelowna, has been open to the public for just over a year and its owners have been “overwhelmed” by the public's interest and support. “It has made it possible for us to basically switch jobs. To stop doing the things we were pretty much ready to stop doing anyway,” owner Caroline MacPherson told The Huffington Post B.C. in an interview. Last year, MacPherson and her husband Greg “Roo Man” Wightman took a risk and sidelined their careers as a paramedic and salesman to run the farm full time. But how they ended up with a family of 'roos in the first place, was by complete happenstance. In the '80s, New Zealand was in the middle of a program to eradicate all non-native species, including kangaroos. “Some of these animals were becoming pests. Some were competing with native species and displacing them. Unfortunately, for the most part, the non-native species of New Zealand were either shot or poisoned,” MacPherson explains. A friend made a deal with a New Zealand farmer to save ten kangaroos “slated for destruction.” They were brought to Canada and settled on MacPherson’s farm, a then-government designated quarantine area. Twenty-four years later – with over two decades of marsupial-raising experience under her belt – MacPherson has added capybaras, emus, goats and pigs to keep the kangaroos company. 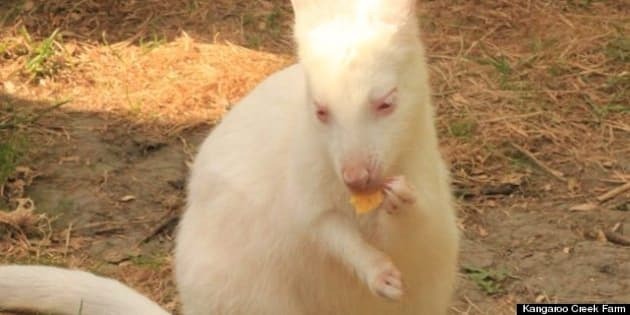 Visitors can also catch a glimpse of an albino wallaby named “Irwin” in tribute to the late Australian conservationist Steve Irwin. The farm will be open on weekends throughout the summer from 10 a.m. – 3 p.m. There’s no set admission fee, but a five-dollar per person donation is strongly encouraged to help cover insurance and other basic operational costs. However, no one will be turned away because they honestly can't afford the suggested donation. “If they genuinely cannot afford to pay, then we’re happy to have them as our guest," says MacPherson.